Thanks for visiting my official website. Check out the different features and information within, and be sure to return soon. We'll be updating the site on a regular basis, so stay tuned! Izzo was signed by the Miami Dolphins as a free agent in 1996. He first came to local noteriety based on a sound byte that circulated during the pre-season of Izzo's rookie year, where Miami coach Jimmy Johnson told the team that only two players were guaranteed to make the team: one was Dan Marino and the other the then-unknown Izzo. 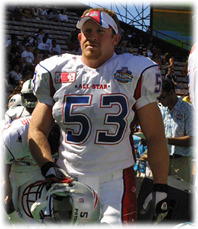 He spent most of his time on special teams, and was rewarded with his first trip to the Pro Bowl in 2000. He later signed with New England in 2001, and played on all three of the Patriots' Super Bowl championship teams (2001, 2003 and 2004). He also had three more trips to Hawaii as the AFC special team representative in 2002, 2004 and 2005. Through 2008, Larry Izzo has tallied more special teams tackles than any other active NFL player (243 in 172 career games). Additionally, Izzo has 21 special teams tackles in 18 career postseason games. While the NFL doesn't publish official statistics on special teams tackles, that should rank Izzo second in NFL history behind Buffalo's Mark Pike (283). He ranks ahead of Dallas Cowboy legend Bill Bates (216) and Bills' legend Steve Tasker (186). If you'd like to send an email to Larry Izzo, email him here. In early 2005, after the Patriots beat the Eagles in the Super Bowl and my third trip to the Pro Bowl in Hawaii, I had the honor of visiting our Troops in Iraq and Afghanistan. It was an unbelievable journey for me with memories that will stay with me forever. I made a promise to our Troops that I would never forget them, fulfilling a commitment I had made in my father’s memory. Larry, Sr., my father, graduated from West Point in 1967 and retired as a full Colonel in 1990 after 23 years in the military. He passed away on October 25, 2003, and as a tribute to my wonderful father and the influence he had on my life, I have always wanted to do something to help the families of our American Troops. As a first step, I’ve decided to host an annual event with my New England Patriot teammates. All proceeds will go to the families of American Troops who have died in combat, and to those American Veterans left disabled as a result of their military service in Iraq and Afghanistan. 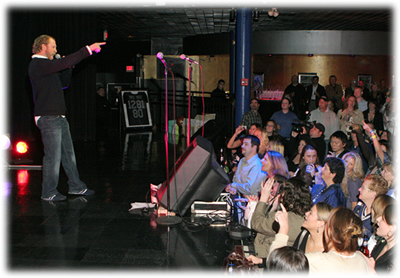 Every fall I will host “Karaoke with Larry Izzo – A benefit for our Troops and their families”. My teammates will be there to perform their best Karaoke with corporate sponsors, mingle with the fans and enjoy a great night. This will be a night for all to remember and the proceeds will go to the heroes who unselfishly served in Iraq and Afghanistan and to the families of those deceased Troops. Please visit the official website for event info and tickets.